Three thousand feet above China, it was Jake's turn to jump. He slid his pistol, knife, and ration packets into the pockets of his leather jacket and edged toward the open hatch of the B-25 bomber. He checked the tension on the harness of his parachute, made sure the handle of the ripcord was free, and then began lowering himself out of the hatch and into the darkness. 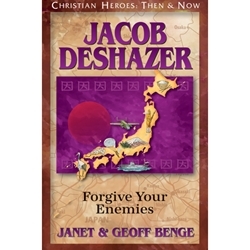 After the war, Jacob returned to Japan and served his former enemy for thirty years as a missionary. His testimony of forgiveness and reconciliation - of love over hate - inspires a powerful gospel message for our lives today. This best-selling, missionary biography series - Christian Heroes: Then & Now - chronicles the exciting, challenging, and deeply touching true stories of ordinary men and women whose trust in God accomplished extraordinary exploits for His kingdom and glory. Each inspiring true story of a man or woman who answered God's call is a testimony to a real-life adventure of faith and determination.